Earlier today Daniel Kaplan released a screen shot for the new Minecraft Advance Touch Technology Interface System (MATTIS). No details have been given on how it will work but, it appears to be a dynamic list that can expand and collapse. More information about MATTIS is expected to surface in the coming weeks. Mojang has rolled out a minor update to put a fix on the ongoing tree problem, and bugs on the Xperia Play device. Tree trunks now work on old maps. Xperia Play swimming & flying fix. Notch and the Mojang team wins Special Award from BAFTA for excellence in the field of video games. Minecraft: Pocket Edition releases newest patch featuring new improved control features for tablets. 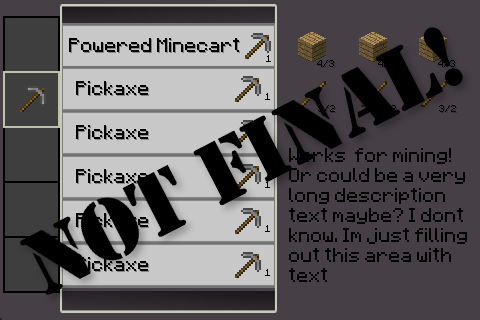 Mojang hints at new interface system for Pocket Edition called MATTIS (Minecraft Advance Touch Technology Interface System) but, have not yet given any details about it. Jens spends his week in Vegas on vacation. Mojang releases a slew of new avatar items for Xbox360 players as they wait for Minecraft to be released on the console.